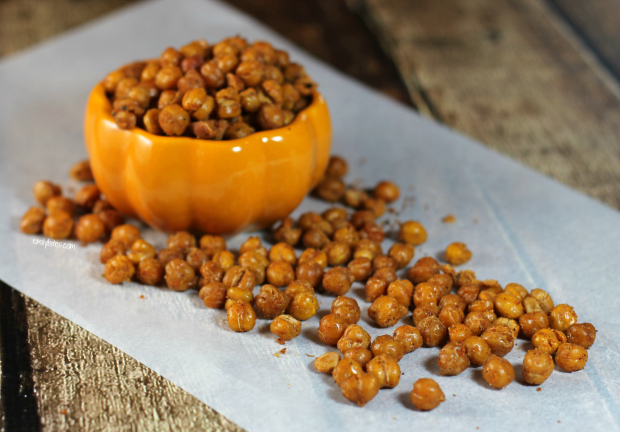 If you haven’t tried roasted chickpeas before, you’re in for a real treat. You probably usually think of chickpeas on salads or mushed into hummus, but roasting and seasoning them makes for a crunchy, salty snack that tastes amazing and is packed with fiber and protein. 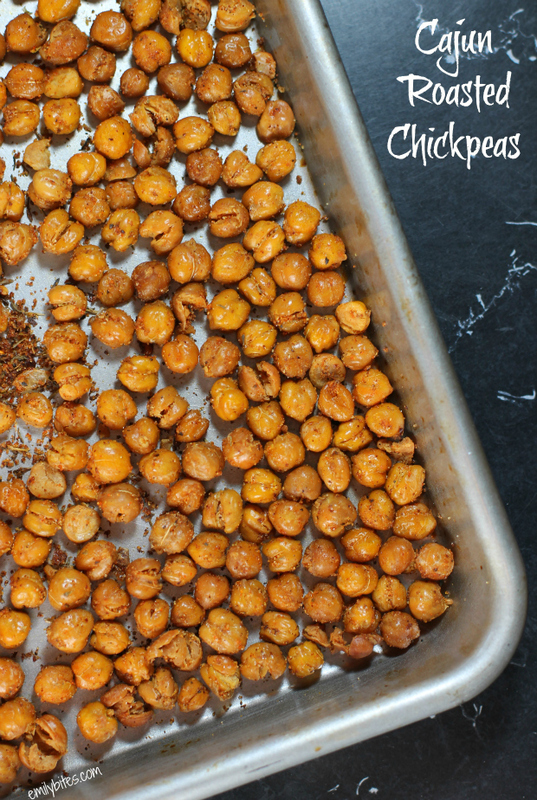 This Cajun Roasted Chickpeas recipe is super versatile, because you can really use any seasoning you want. I chose a Cajun blend because I was in the mood for something spicy, but you can follow the same technique and just sprinkle with salt or add taco seasoning or ranch mix or any number of other spices. The flavor possibilities are endless! If you love Cajun spice then I definitely recommend trying it with the spices below – I loved it. Some people add the oil and spices before roasting, but I’ve always dry roasted them and I’ve had tons of luck getting them to just the texture I like that way. All ovens vary a bit so if your chickpeas need an extra 10 minutes or so to crisp up you can always stick them back in. You can also easily double the recipe if you’re making these for a party snack – they’re sure to move fast! Drain and rinse the garbanzo beans and then spread them in a single layer on a clean dish towel. Pat dry with another towel and allow them to sit and dry for another 5 minutes. 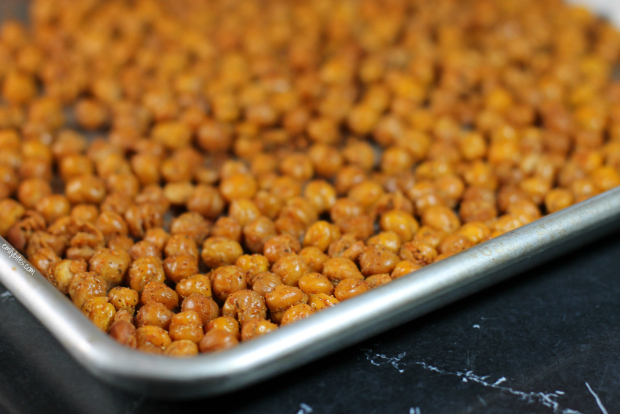 Transfer the chickpeas to a single layer on a baking sheet and place in the oven. Bake for 30 minutes, shaking the pan (or stirring the chickpeas) every 10 minutes. While the chickpeas are roasting, combine all the spices listed and stir until well mixed. Remove the chickpeas from the oven and spray them with cooking spray to coat. Immediately transfer the chickpeas to a mixing bowl while still hot and sprinkle the seasonings over the top. Mix together until chickpeas are well coated. 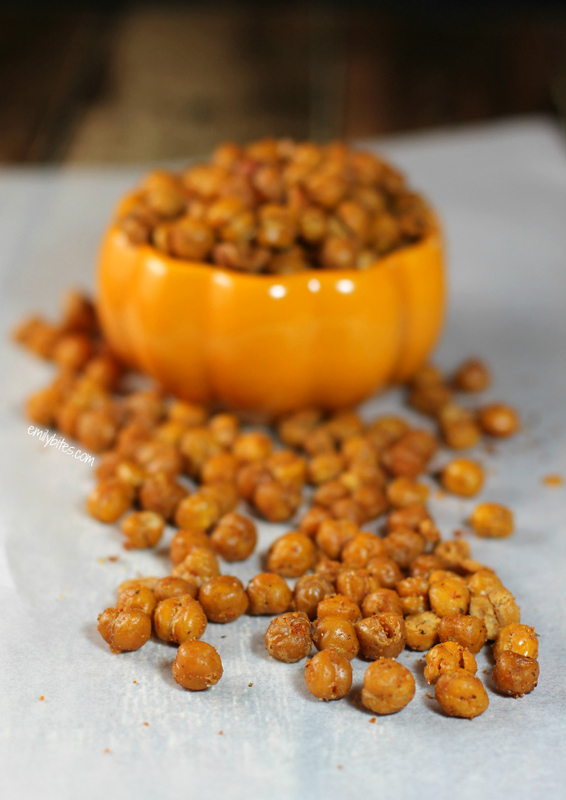 Spread the seasoned chickpeas back onto the baking sheet and return them to the oven for another 10-15 minutes. Turn the oven off and leave the chickpeas in for another 10 minutes. Remove from the oven and allow to cool for about 5 minutes. As a chickpea fan I will definitely try this out!!!!! YUM! I wasn’t a huge fan of chickpeas, but I went ahead and bit the bullet and made some. SO good and a hit with everyone at work. I can’t wait to experiment with different seasonings. Can I soak them before baking? I’m not sure why you would, you can just rinse them and they’ll work great! I am making these now. Can’t wait to try them. Wouldn’t these be 0 points on Freestyle? The header on the points was updated, but the points still say 3.